This easy cupcakes recipe makes the perfect introduction to fall! 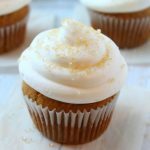 With warm spices and deep pumpkin flavour, these pumpkin spice cupcakes are delicious served with a warm cup of cider! Preheat your oven to 350 degrees Fahrenheit and prepare one 12-cup muffin tin with some paper liners. Combine the pumpkin puree, eggs, sugar and oil in a large bowl and whisk everything together until combined. In a separate bowl whisk together all the dry ingredients (the flour, baking soda, spices and salt) and then dump the dry ingredients into the wet ingredients. Using a rubber spatula or a wooden spoon, combine the wet and dry ingredients until they're just combined and the flour just disappears. Spoon the mixture evenly into the 12 muffin cups lined with paper liners until all the batter is distributed evenly. Bake the cupcakes at 350 degrees for about 20 minutes, or until a toothpick inserted into the middle of one of the cupcakes comes out clean. When they're done, the pumpkin spice cupcakes will be nice and puffy, with a gorgeous brown colour. Remove the cupcakes from the tin and place them on a wire rack to cool completely while you prepare the frosting. Mix the room temperature cream cheese and the room temperature butter on high speed in the bowl of your stand mixer (a hand-held mixer works just fine for this job too!). Add the icing sugar, one cup at a time, scraping down the bowl between each addition to make sure it's incorporated evenly. Add the milk one teaspoon at a time, making sure to watch the texture of the frosting carefully. If your frosting is quite soft you may only need to add 2 tsp of milk. Once the milk is added, continue to mix on high speed until the frosting is light and fluffy (about 2 more minutes). Once the cupcakes have cooled completely to room temperature, pipe the frosting in a circular motion on top of each cupcake using whatever tip you wish (or simply spread it, if that's more your style). Sprinkle some turbinado sugar over each cupcake to garnish, and serve!